In late February, Canada’s former justice minister, Jody Wilson-Raybould, testified before a parliamentary committee that Prime Minister Justin Trudeau and other high-ranking aides had pressured her to intervene on behalf of the engineering firm SNC-Lavalin in a criminal case being pursued against the company. Trudeau now faces his biggest political crisis since taking office, with general elections looming in October. In an email interview, Christopher Sands, director of the Center for Canadian Studies at the Johns Hopkins School of Advanced International Studies, explains the background of the SNC-Lavalin scandal and its implications for Trudeau and Canada’s political landscape. World Politics Review: How extensive are the corruption allegations against SNC-Lavalin, and why has this been such a big headache for Justin Trudeau? Christopher Sands: SNC-Lavalin is a large engineering firm headquartered in Prime Minister Trudeau’s home constituency, Montreal. It is facing charges in Canada over payments of 48 million Canadian dollars ($36 million) to Libyan officials between 2001 and 2011, when Libya was ruled by Moammar Gadhafi. The company denies all charges against it, and also claims that the company has been operating in compliance with high ethical standards since 2012, when new management took over. Under Canadian law, if SNC-Lavalin is found guilty of fraud or corruption in either of two ongoing cases, the firm will be barred from contracts with the Canadian federal government for 10 years. Several other countries, as well as international financial institutions such as the World Bank, would respond to a conviction in Canada by blacklisting the firm as well. This scenario would be disastrous for the firm, potentially even causing it to go bankrupt. One way to avoid that outcome would be for SNC-Lavalin to reach what is known in Canadian law as a deferred prosecution agreement, or DPA. Under this mechanism, as long as SNC-Lavalin cooperates with authorities in thoroughly investigating the abuses, the case could be settled with fines and public disclosure of the investigation findings. The decision to negotiate a DPA is normally an act of prosecutorial discretion. But over the past several months, a number of senior political figures, up to and including Trudeau himself, urged then-Justice Minister Jody Wilson-Raybould to personally order a DPA with SNC-Lavalin, against the advice of career prosecutors on her staff. She resisted that pressure, and was subsequently demoted to minister for veterans affairs by Trudeau, who instructed her not to speak to the media nor to Parliament about the matter. 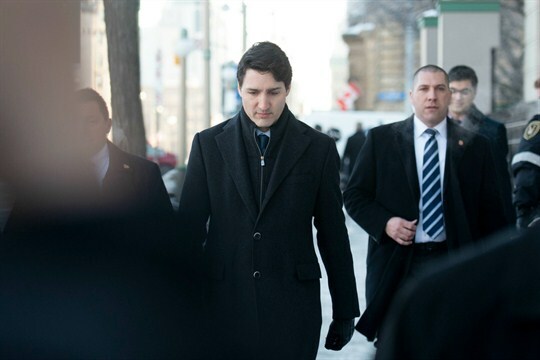 Trudeau told reporters it was a routine shuffle precipitated by the retirement of Treasury Board Minister Scott Brison, and that Wilson-Raybould was not being punished. Wilson-Raybould resigned from the Cabinet shortly thereafter, and provided detailed testimony to a parliamentary committee in which she claimed that she was punished for refusing to order a DPA in the SNC-Lavalin case. Trudeau compounded his problems by dismissing Wilson-Raybould’s testimony with the phrase, “She remembers things differently,” echoing the words he used in 2018 to dismiss accusations that he had groped a reporter at a public appearance in 2000. Brison’s replacement at the Treasury Board, Jane Philpott, also resigned from the Cabinet last week, explaining that she had lost confidence in Trudeau’s leadership. WPR: How have these resignations harmed Trudeau’s standing with women and with Canada’s indigenous peoples? Sands: Trudeau campaigned in 2015 as a feminist and advocate for restorative justice for Canada’s indigenous peoples. Wilson-Raybould, the daughter of a hereditary indigenous leader in British Columbia, was the first indigenous minister of justice and the highest-ranking woman in the Cabinet aside from Foreign Minister Chrystia Freeland, who has so far been silent on the ongoing scandal. Philpott comes from Ontario and was one of the most accomplished women in the Cabinet; prior to her position at the Treasury Board, she served for two years as minister for indigenous services, a role in which she was well-regarded. Even before this scandal erupted, some indigenous leaders had expressed disappointment in the Trudeau government’s lackluster efforts to address indigenous issues. Wilson-Raybould’s high-ranking position was one of the few bright spots, which made her demotion all the more disappointing. Her eventual resignation, and Philpott’s, caused some indigenous leaders and citizens to feel disrespected. WPR: How much worse could the political fallout get for Trudeau? Might this scandal provide a boost to opposition Conservatives ahead of the general elections later this year? Sands: These resignations have damaged the Trudeau “brand” by calling into question the prime minister’s feminist credentials and respect for indigenous people. Last week, one of Trudeau’s fellow lawmakers from Ontario, Celina Caesar-Chavanne, made public her decision not to run for re-election this year. She claimed that Trudeau had been hostile and intimidating to her when she told him privately about her decision. Caesar-Chavanne, who is black, was Trudeau’s parliamentary secretary—a high-ranking position—from 2015-2017. Further statements or resignations that reinforce the claims that Trudeau is not the leader he claims to be will undermine his appeal, and could hurt Liberal Party candidates in the October 2019 federal elections. The Conservatives are the alternative for many voters in the center, and two smaller parties, the New Democratic Party and the Green Party, offer alternatives for voters to the left of the Liberals. The election will probably be decided by how much support the Liberals lose, not by a gain for the Conservatives on their own merits. Challenging Trudeau on his treatment of women and indigenous peoples would allow Trudeau to change the subject and portray Conservatives as even worse for marginalized groups. Parliament will adjourn by summer, not meeting again until after the elections, which are still six months away. This is plenty of time for Trudeau to turn things around, but if he doesn’t, Wilson-Raybould or Philpott could challenge his leadership of the party and succeed him as prime minister.